You are here: Home / HVAC Info & Articles / Articles / Why is My Air Conditioner Clicking? Have you been hearing unusual noises coming from your AC unit? 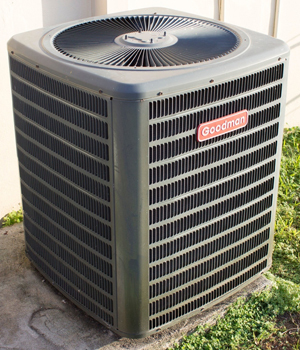 Central air conditioners emit a variety of noises that range from normal to abnormal. Sounds like blowing air, soft whirring, one soft click when your system comes on, are all normal for a properly operating HVAC system. But if you hear a persistent clicking sound coming from your AC, it might be an indication that something isn’t right and professional air conditioner repair may be necessary. Here are some probable causes. The source of the noise is an important factor in determining the cause. Depending on where the sound is coming from, the problem could be mechanical or electrical, possibly serious or more minor. Locate the source of the sound and consider the possible causes. Outside unit: When the clicking sound comes from the outside unit, it could mean there is a loose part somewhere. It could be a bolt, a wire, a refrigerant tube, or some other part that may just need to be tightened. It’s best to call an HVAC technician to diagnose the problem and repair it. Inside unit: If the clicking sound seems to coming from the inside unit, whether it resides in your attic, basement, or a closet, it is likely the fan that is part of the air handler. An obstruction to the fan blades will cause a clicking sound every time the blades hit the obstruction as they spin. If the clicking starts out slow and gradually gets faster and then persists, you most likely have a fan-related problem. It could also be a bent fan blade causing the clicking sound. Call your AC repair service to find the reason for the clicking and repair it. Electrical system or circuit box: Each time the indoor temperature gets too high and your air conditioner comes on, you may hear a click (and see a slight dimming of the lights) as the AC pulls the voltage it needs to start up. If you hear a click but your AC doesn’t come on, you likely have an electrical problem. Sometimes wires can corrode and get stuck together. Other parts like the capacitor or control board switch could be bad and need to be replaced. If you hear a click in your circuit box it means something has tripped a circuit breaker. If it happens to be your air conditioner, it could indicate a problem, especially if it happens frequently. Never attempt to fix electrical components yourself, always call for professional air conditioner repair. Anytime you hear unusual sounds coming from your AC, the best thing to do is call Alamance Oil. Trained, experienced technicians will identify the problem and repair it quickly and accurately. Don’t ignore the sound or you could end up with a broken down air conditioner on a hot day. A simple repair done at the right time can save you from having to replace your entire system. Don’t wait, call Alamance Oil today: (336) 226-9371.
https://www.berico.com/wp-content/uploads/2018/12/header-logo-new-3a.png 0 0 berico_admin https://www.berico.com/wp-content/uploads/2018/12/header-logo-new-3a.png berico_admin2017-06-18 19:56:352017-06-18 19:56:35Why is My Air Conditioner Clicking?